Poachers have killed yet another one-horned rhino in Assam's Kaziranga National Park, the fourth to die in one week, sparking protests over the state's failure to check the menace. 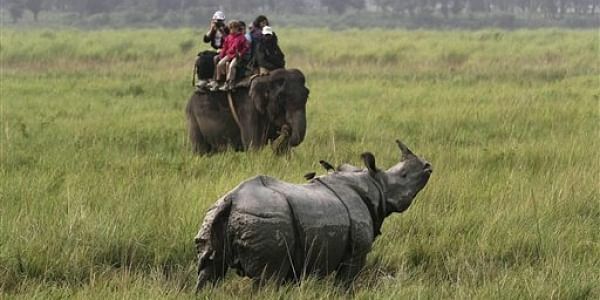 GUWAHATI: Poachers have killed yet another one-horned rhino in Assam's Kaziranga National Park, the fourth to die in one week, sparking protests over the state's failure to check the menace. A forest official said they recovered the carcass of the slain rhino cow from near the Kahara range of the park on Thursday. Her horn was missing, indicating she was poached. The All Assam Students' Union (AASU) on Friday staged a massive protest in Golaghat district that borders the park. They demanded the immediate resignation of Forest Minister Pramila Rani Brahma. On November 2, poachers had killed the first rhino at Burhapahar range while another two rhinos, a mother and her calf, were killed within 48 hours of this in the same park range area. After the November 4 killings, Assam Chief Minister Sarbananda Sonowal had asked the Superintendent of Police of the surrounding districts of the park to assist the Forest Department in containing the menace.